IPSWICH senior firefighter Mark Meier was just one of many to be caught in the thick of the inland tsunami that devastated the Lockyer Valley in early 2011. More than three years on, Mr Meier, along with seven of his urban crewmates, have earned the second-highest bravery award presented to Queensland firefighters in a special ceremony at Beenleigh. It was the first time any firefighter had been given the Commissioner's Commendation for Bravery since the award's inception a few years ago, but nobody would argue these firefighters were not worthy of such recognition. Mr Meier, Mark Stephenson, Nathan Chadwick, Ian Bland, Brendon Ashby, Phil Paff and Geoff Dixon were rewarded for being a key part of the teams of Ipswich firefighters who rushed to areas including Grantham, Withcott, Murphys Creek and Minden during the peak of the disaster. Kerry Weir will receive his award in Toowoomba next Tuesday. Twelve lives were lost, but many more were saved because of the actions of firefighters who pulled people from roofs, verandas, cars and trees. 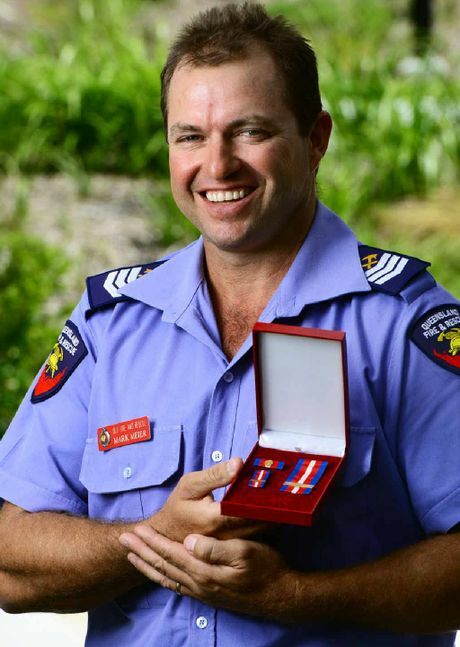 QFES Commissioner Lee Johnson presented bravery medals to more than 50 urban, auxiliary and rural firefighters. "It is an honour - this is the pinnacle of my career so far," Mr Meier said. "It was a group effort to receive that award - the 2011 floods were like nothing any of us had seen before." Mr Meier - a lieutenant with the Rosewood Auxiliary at the time - was on holidays when he received a pager message telling him to go to Withcott and assist people caught in the floods. They never made it to their original destination, as the water had already gone over the Gatton bypass. The crew was diverted to Grantham, which they accessed via some back roads which were also under water by then. "We could hear the talk on the radio on the way out there - about houses floating down the river and cars being washed away," he said. "It was just like people described it; an inland tsunami." Mr Meier's crew went to houses ahead of the water and began trying to convince people to flee. With the water rising, Mr Meier's crew waded through water on foot in search of people who were stranded. "People were stuck in the top level of two-storey houses," he said. "We were checking vehicles that had been washed into trees or power poles, unsure if there would be people inside." The search for people continued until 1am the next morning, but the job was far from over. Mr Meier said it was unfortunate that more firefighters could not be recognised. "Without doubt, there would be 200 people who were worthy of receiving medals," he said. Crime A 40-year-old man is in custody following the death of a man found at an intersection south of Brisbane this morning with severe head, neck and chest injuries. News Queensand's worst roads have been named and shamed in a new report.